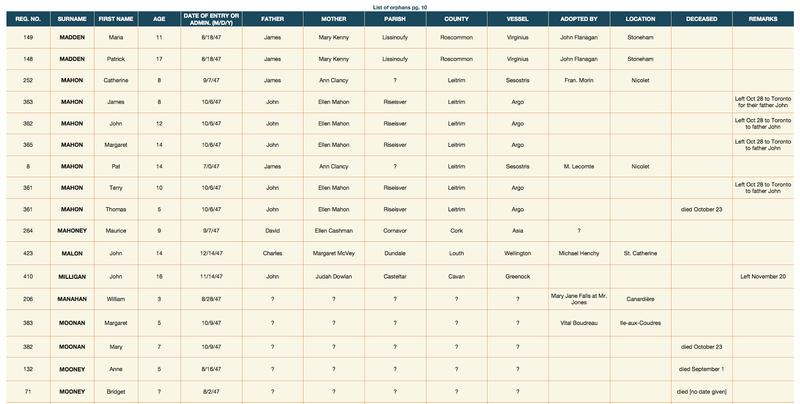 The search for my family across time. "...to seek and to find the past, a lineage, a history, a family built on a flesh and bone foundation." 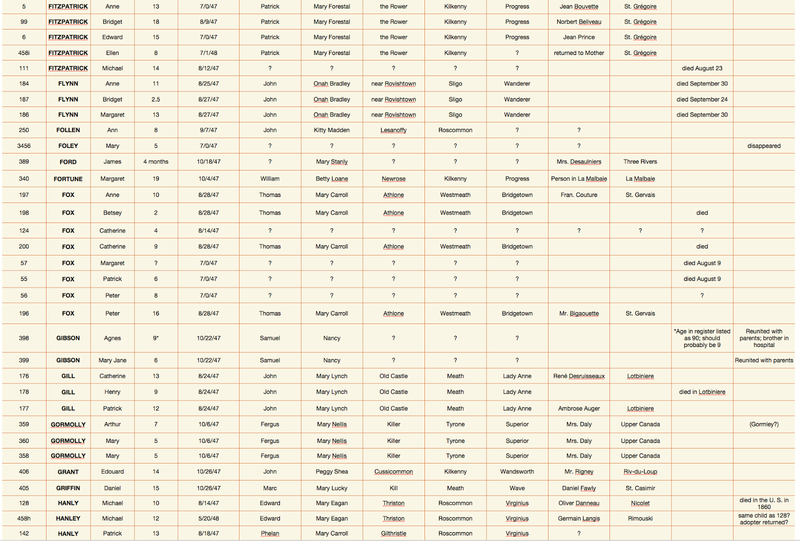 Here is my transcription of a listing of almost 500 children who were registered as 'orphans' during the 1847 navigation season, at the time of the Great Famine of 1845-1852, when they travelled from Ireland to Grosse Île Québec, and on to other areas of Canada and the United States. You will notice the word 'orphans' appears in quotes because not every child on the list was in fact an orphan; some were simply temporarily separated from their family members. Their status is noted on the document. 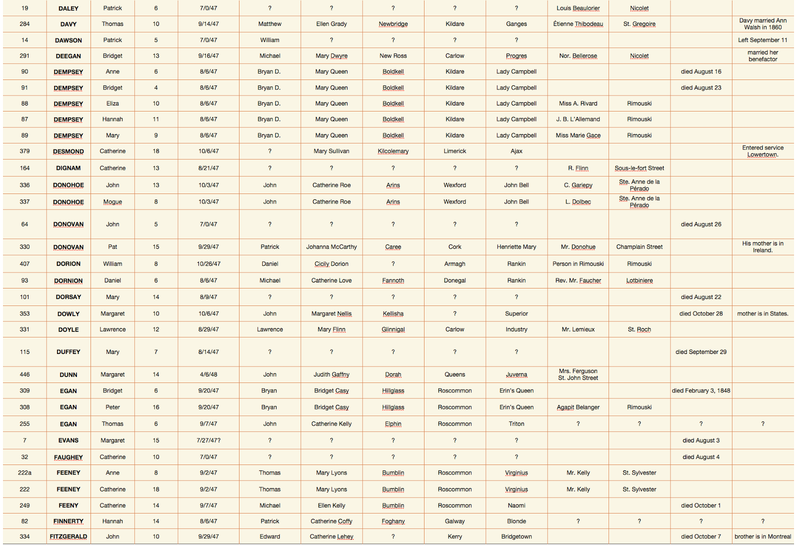 The blank cells in the spreadsheets are blank because this information does not appear on the original document. The cells which bear question marks do so because the question marks appear on the original document. Any remarks which do not appear on the original document appear in square brackets. 'Reg. No.' is registration number, the number assigned to each child for administration purposes. The 'date of entry or admin.' is either the date on which they landed or the date on which they were processed. 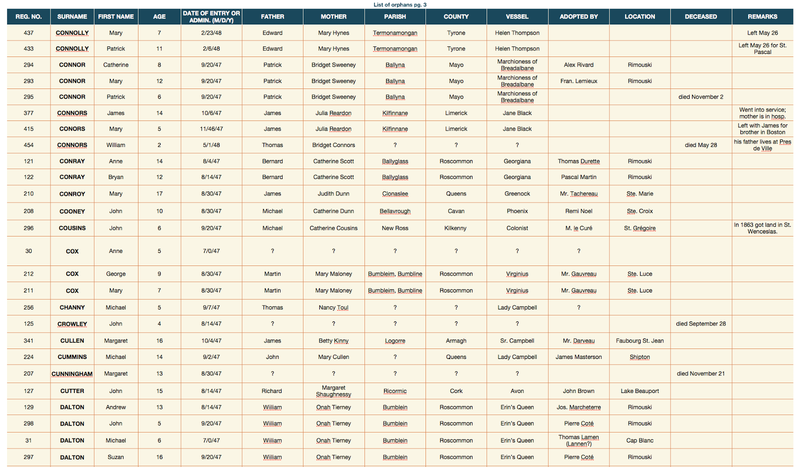 You will note that some administration dates noted are in 1848. 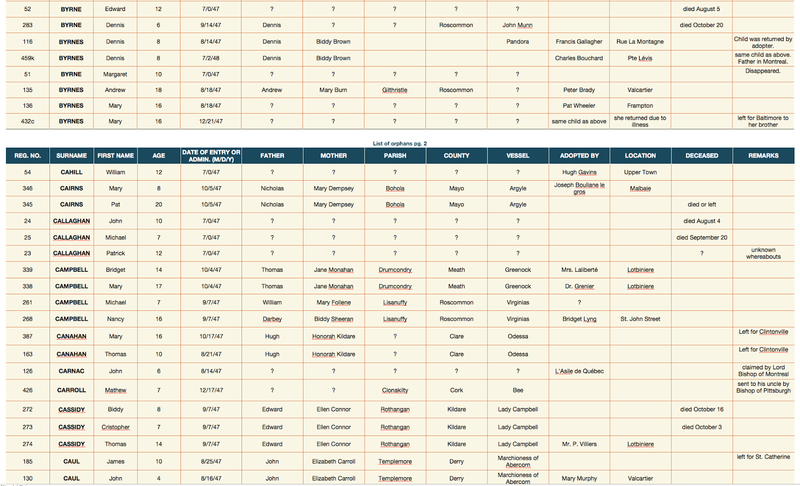 As you can see, the information is arranged alphabetically by surname and then forename, so peruse the entire range of names within a particular surname when you are searching, in order to locate siblings. There is some duplication. 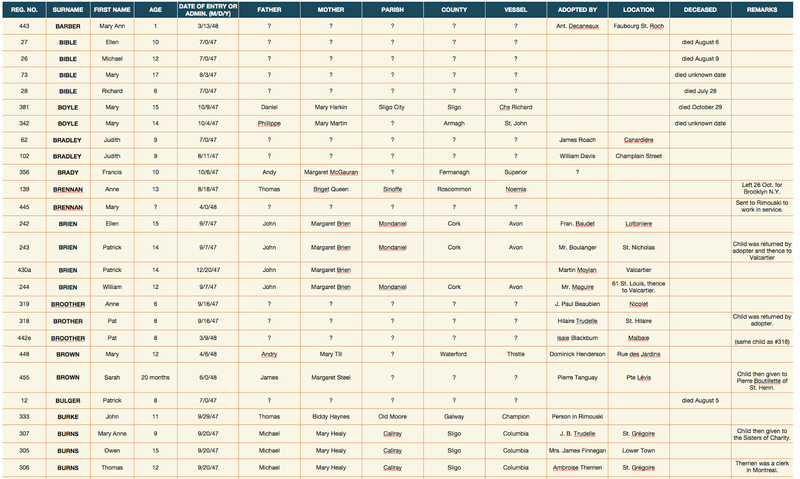 Surnames beginning with 'Mc' or 'Mac' appear at the beginning of the 'M' surnames. 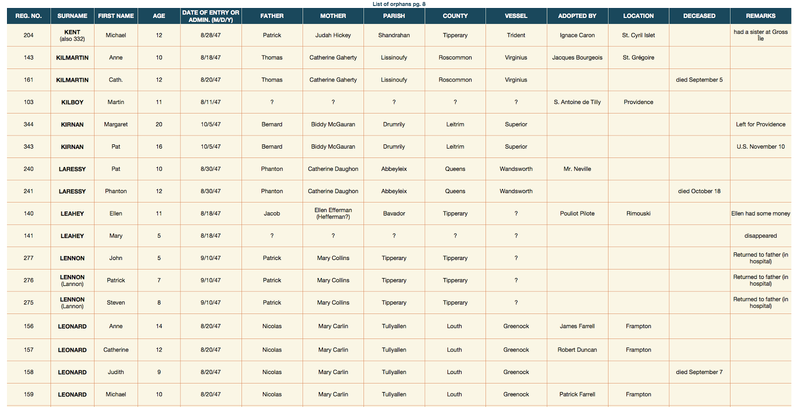 The information included is from an 1847 register of children who stayed in the Catholic Orphanage of Québec prior to being adopted or returned to family in Ireland, or sent to family in Canada or the United States. The orphanage was under the operation of La Société des Dames Catholiques de Québec, Catholic nuns who operated both an orphanage and a school. 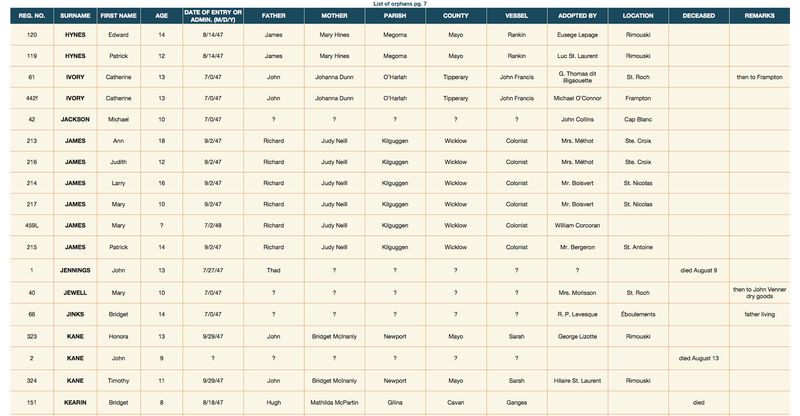 If the person for whom you are searching was not aided by the Catholic Orphanage of Québec, his/her name will not appear on this list. 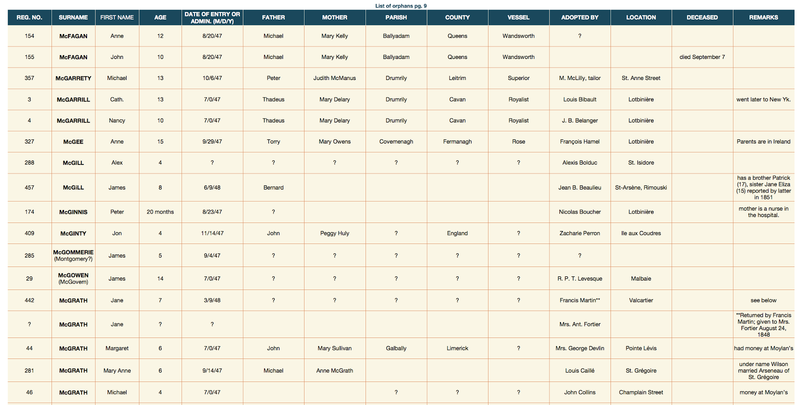 If that is the case then you may find it helpful to consult the Library & Archives Canada files of 1847 via http://www.bac-lac.gc.ca/eng/discover/genealogy/Pages/introduction.aspx, particularly their immigration databases at http://www.bac-lac.gc.ca/eng/search/Pages/ancestors-search.aspx. 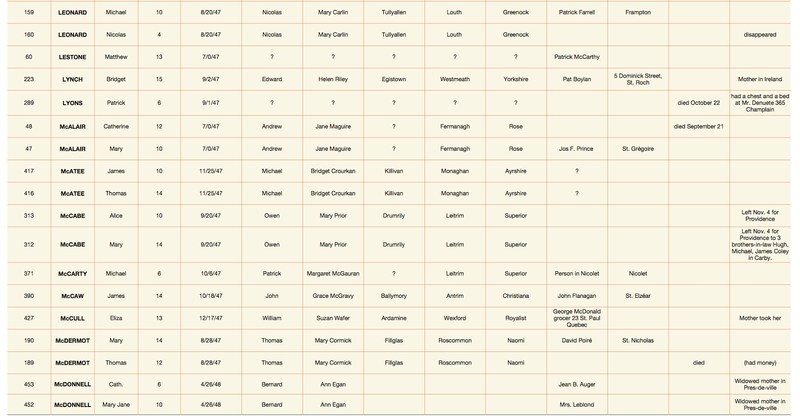 Be sure to visit the Find Irish Ancestors: Research Aids page on this blog, and look under the heading The Great Famine of 1845-1852 for more resources which you may wish to consult. Copyright©irisheyesjgg2007-2015. All Rights Reserved. DO NOT COPY OR REPOST. Thank you for viewing today's post. Welcome Everyone! Thanks so much for following my Blog. All photographs and written material on this site are the exclusive property of Jennifer Geraghty-Gorman and may not be used for any purpose without prior written permission of the author. ©Copyright Jennifer Geraghty-Gorman aka irisheyesjgg 2004-2016. All rights reserved. 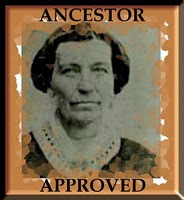 I am very grateful to be Ancestor Approved! Thank you to Carol, Sharon, Jo, and Susan for the recognition. All Materials, including Background Photograph, Copyright©irisheyesjgg J. Geraghty-Gorman 2007-2016. Picture Window theme. Powered by Blogger.